Dopamine is a neurotransmitter, which is a chemical that carries messages between cells. It’s involved in regulating many everyday activities, including memory, sleep, mood, learning, movement and behavior. A dopamine deficiency is associated with disorders like Parkinson’s disease and attention-deficit hyperactivity disorder. Herbs may help to increase dopamine levels naturally. Consult your health care provider before starting any herbal therapy. Herbs increase dopamine mainly by inhibiting its breakdown by enzymes, such as monoamine oxidase A and B, also known as MAO-A and MAO-B. By blocking these enzymes, herbs help to prevent the re-uptake, or absorption, of dopamine into your cells, and to keep more of it in the synapses, or spaces between cells, where neurotransmitters are most active. Check with a qualified practitioner for advice about dosage and preparation of herbs to increase dopamine. Periwinkle, or Vinca minor, is a small European herb with purple flowers. 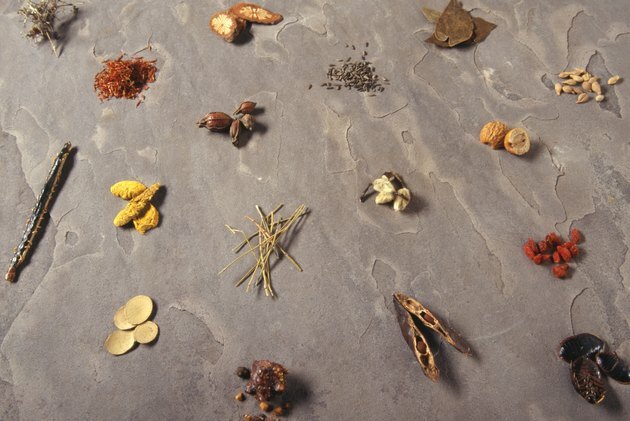 Herbalists use its aerial parts to treat digestive problems, hemorrhage, memory loss and senility. The active ingredients are potent indole alkaloids. In their 2001 book, “Herbal Remedies,” naturopathic doctors Asa Hershoff and Andrea Rotelli state that periwinkle is useful for memory loss because it increases dopamine and noradrenaline, which are both involved in memory and cognition. This herb may upset your stomach. Ashwagandha, or Withania somnifera, is a perennial shrub native to Asia, Africa and Europe. Indian Ayurvedic healers use the roots as a general anti-aging tonic, and the plant also has antibiotic, anti-inflammatory and antitumor actions. A study published in the September 2009 issue of the “Journal of Ethnopharmacology” found that ashwagandha root extract raised dopamine levels and improved motor function in test animals who had their dopamine levels reduced by chemical antagonists to mimic Parkinson’s disease. This research suggests that ashwagandha may improve mobility in patients with dopamine deficiency disorders like Parkinson’s. Do not use this herb during pregnancy. St. John’s wort, or Hypericum perforatum, is a European shrub with clusters of tiny yellow flowers. It has a long history as a remedy for wounds, burns and pain, and contemporary herbalists also use it to treat mild depression. The main ingredients are hypericin and hyperforin, which affect the central nervous system. In their 2009 book, “Medicinal Plants of the World,” botanist Ben-Erik van Wyk and biologist Michael Wink state that St. John’s wort extract blocks the enzymes that break down dopamine, thus increasing its levels in the brain and making it a useful treatment for depression. Do not combine this herb with other antidepressants.